Blogger Helen is moving house and keen to find a name for her new abode. All ideas welcome, but she’s especially keen to find a “Marian” name. Being of simple mind, I suggested “Marian House” but – although I’m sure she’s added it to her list – I don’t think it quite cut the mustard. So, over to you lot. Can YOU find the perfect name for Helen’s new house? Note, the blogger who submits the winning entry will be flown to the Vatican where a private meeting with Pope Francis will take place. If the winning blogger can get HIM to change HIS name (preferably to Pius XIII) then said winning blogger will also be flown back home! Bloggers may submit more than one suggested name. In fact, bloggers may submit as many as they wish. All will be given serious consideration. So, let the competition begin! Click here to read the Catholic Encyclopaedia account of the life of St Joseph. We’re launching this thread on St Joseph ahead of the Feast Day, because, in preparation for our usual closure during Holy Week, we’ve closed all the discussion threads early. The atmosphere on the blog has not been good recently, and so we need time to recollect ourselves as the end of Lent approaches, and we enter into the events of Holy Week. St Joseph, advocate of the dying and the sinner, pray for us who have recourse to thee. This thread is a purely devotional and fun thread. As with all Feast Day threads, we may post favourite prayers, hymns litanies, etc. And a few good clean fun jokes will also be welcome. This is not the place for controversy – it is a Feast Day thread to learn more about the saint of the day and to share favourite prayers and jokes. Enjoy! A Very Happy Feast of Saint Joseph! Egypt’s deserts rough and wild. teach, O teach us how to die. sing hosannahs to their Lord. Share your favourite prayers and stories about St Joseph. Today’s Feast of St Joseph The Worker welcomes in the Month of Mary, so we have a double celebration to mark 1st May. It’s good to take time out to reflect on the lives of our greatest saints, as we do from time to time on this blog. St Joseph is one of the most powerful saints in Heaven: one of his titles is Protector of the Universal Church, so let’s unite in praying to him today for special graces for the Pope and Bishops, as we witness a worsening of the crisis afflicting the Church in our times. Prayer intentions, especially for those who are struggling either to find work or to cope with their employment, are welcome on this thread. Also, feel free to share your favourite prayers, hymns and stories about this great saint. Tributes, too, to Our Lady, please, as we enter the Month of Mary. 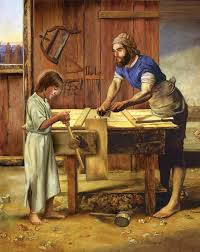 St Joseph the Worker, pray for us … Our Lady, Queen of Heaven, pray for us.